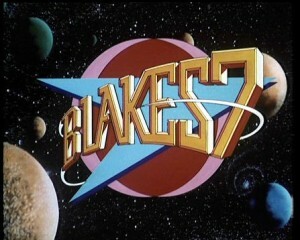 Blake’s 7 is a BBC One science fiction show which ran for four series between 1978 –1981. Set in the future, the show is about a group of outcasts who fight a guerrilla war against the totalitarian Terran Federation from an alien spaceship. The series was created by Terry Nation (Doctor Who, And Soon the Darkness, London Conspiracy), who also created the Daleks in Doctor Who. Episode 11 of Series 1, “Bounty”, sees Blake (Gareth Thomas) and Jenna (Sally Knyvette) try to convince Sarkoff (T.P. McKenna), the exiled former president of the planet Lindor to return to lead his people, before the Federation assumes control of the planet. However, the Liberator is taken over by a group of bounty hunters known as The Amagons. “Bounty” is directed by Pennant Roberts (The Sherman Plays, Howards’ Way, Doctor Who) and stars Gareth Thomas (Merlin, Waterland, Parkin’s Patch), Sally Knyvette (Emmerdale, Castlevania: Lords of Shadow, General Hospital), Paul Darrow (Die Another Day, Rough Magik, Law & Order: UK) and T.P. McKenna (Straw Dogs, Red Scorpion, Ulysses). 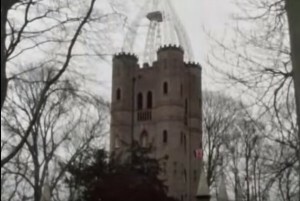 Waterloo Tower at Quex Park features in the episode as the ex-president Sarkoff’s residence in exile. Quex Park is a unique country park of 250 acres set within an estate of 1800 acres in Birchington which offers parkland, gardens and a Regency-style country house with unique museum containing dioramas of African landscapes. Projects which have previously filmed in the Birchington area include Penelope Keith’s Hidden Villages (2015) and BBC Three drama The Things I Haven’t Told You (2008). Blakes 7 aired between 1978 –1981 and is now available for DVD purchase. This entry was posted in Filmed in Kent and tagged Birchington, Blakes 7 – Bounty film locations, Quex Park, TV Drama. Bookmark the permalink.